Compared to the frame, the back is much easier. 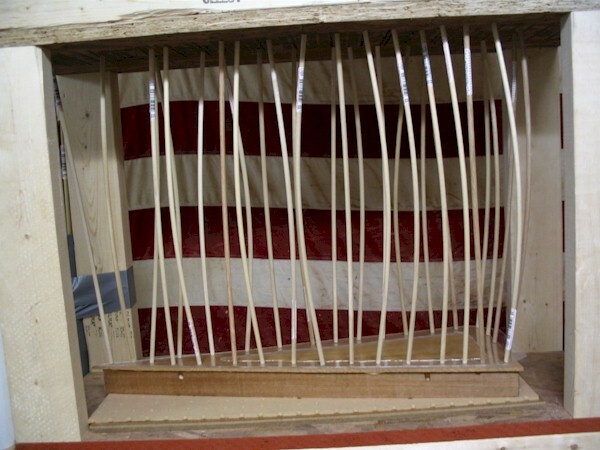 The only thing that may be of trouble is the thickness of wood required—between 3/16″ to 1/8″. Now, there are several ways to get the back down to the required thickness. The first and easiest is just to buy 1/8″ thick plywood. Plywood this thin isn’t always available at hardware stores, but can usually be found at most woodworking stores. This is most commonly available as 1/8 inch “baltic birch” plywood. 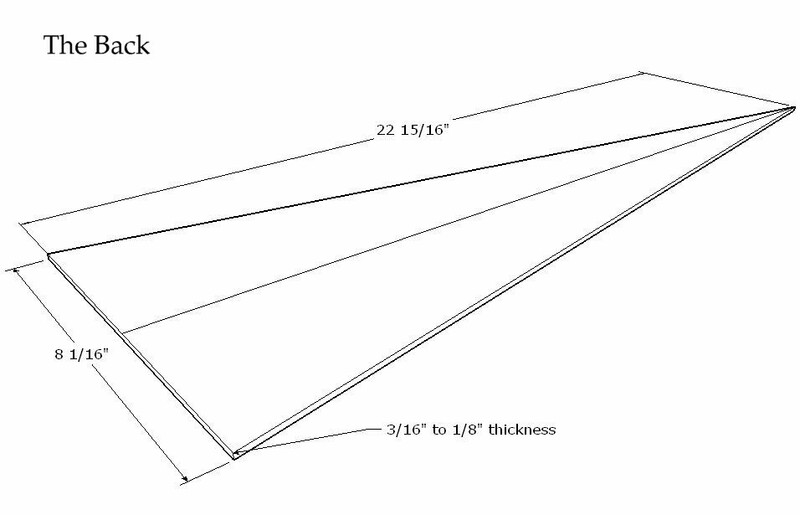 There are also many more vendors online, especially on eBay, which sell wood in 3/16″ and 1/8″ thicknesses. You can try searching for guitar backs as well, (usually found under the search term guitar sets), which are sometimes wide enough to be used as a one-piece psaltery back. Basically, guitar backs come in two halves, which are meant to be edge-glued together to form the back of a guitar, and one half should be ample to cover the back of a much smaller psaltery. Just be sure that the backs are both long enough and wide enough before ordering! 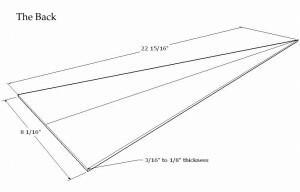 Most backs will not be 23″ long, so you may have to look around. Another option is to find a board the right size in length and width, and plane it down to the right thickness. If you have a thickness planer, this might be a good way to use a wider selection of woods for the back, though it is a bit wasteful. You could also plane the board down to the right thickness by hand using a bench plane. I did this once… Once! I dismissed this pseudo-planer for a long time until I was finally convinced by all of the positive reviews I kept hearing and I decided to give it a try. It really works! 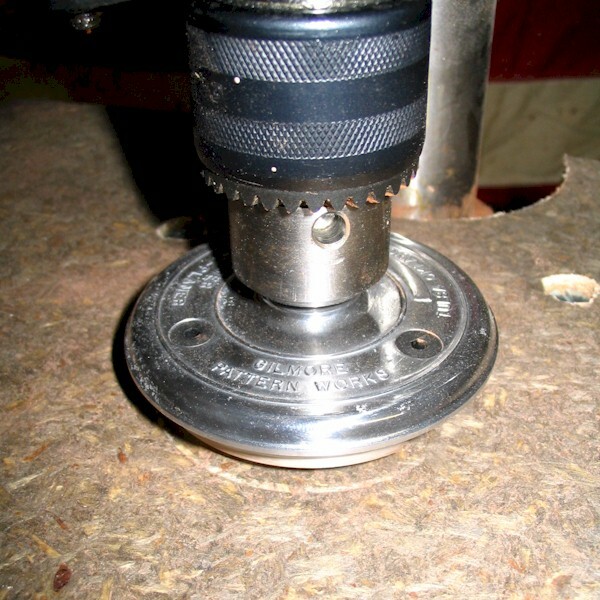 You put it in your drill press, lower and lock the spindle with the depth stop, and run the press at top speed. (Or about 3000 – 5000 rpm.) I first envisioned it as flying off and putting a hole in the wall, but it really does do a good job of planing boards – they don’t call it the Safe-T Planer for nothing. You do have to keep both hands firmly on the board though. Because the cutters on the Safe-T-Planer hit the wood from the side, not the bottom, it works well on figured wood too. Anyhow, this thing is old-fashioned: its been around for decades. The casting says: Tulsa, Oklahoma – going back to the days when things were not only made in the USA, but you also knew the city and the state too. I got mine at Woodcraft. Otherwise, a thickness sander will also do an excellent job at thicknessing the back, but is probably not a common tool to most home woodworkers. There is, however, one other way to get down to the right thickness with what is arguably the most versatile of a luthier’s power tools: a bandsaw. I list a range of thicknesses—from 3/16″ down to 1/8″ because a lot will depend on what woods are used, and how comfortable you are working with wood this thin. I would say with plywood you can definitely use 1/8″ thickness, (and probably even thinner), without any worries because its cross-grain plies give it a lot of strength. But if this is your first time, and you are concerned with the consistency of the wood, you can leave the back at 3/16″ thick. Once you have the back cut out and thicknessed properly, it is time to glue it to the frame of the psaltery. Because the back serves to reinforce the frame, I like to use creep-resistant glue for gluing the back on, just like the glue that was used for the frame. If you haven’t already, now would be a good time to have a look at the various glues used in musical instrument construction. 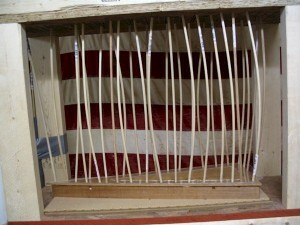 Gluing the back on does not require the use of any jigs or special tools. You can accomplish the gluing with an array of clamps. I think on my first bowed psaltery, I used just about every clamp I owned to glue/fight the back on, which was quite a hodge-podge team of clamps. “Emptied the bench,” as they say in baseball. Most other go-bar decks that I’ve seen use all-thread rods for the four legs, and have an adjustable ceiling. I chose to build an extra-beefy stationary version with solid 2×4 lumber for the legs and reinforced the deck and ceiling with 2x3s. Otherwise, I find that I get some warping and bowing when I start wedging all the dowels in place. I just use sheets of MDF, plywood, or hardboard to bring the instrument up to the correct height, rather than have the table itself adjustable. The nice thing about the go-bar deck is that it lets you put pressure exactly where you need it. 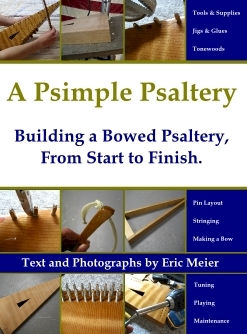 You are not limited to just the edges, but you can get deep in the body of the psaltery – especially over the pinblock – to make sure every square inch of the psaltery is firmly glued down. (I actually added a few more dowels after the above picture was taken. Once the back has been glued on, I like to scrape all of the glue squeeze-out that has formed on the inside of the psaltery. This is the main reason why we have chosen to glue the back on before the top. 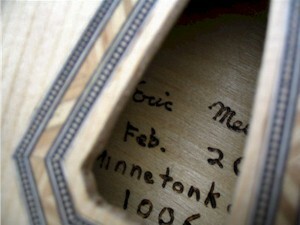 Otherwise, you can see the glue along the edges when you look through the soundhole in the top. One other thing that you might want to consider before you move on to attaching the top is putting a label of some sort on the inside of the instrument: your name, when or where it was made, along with any other relevant information that might be of help to others if you ever give it away to someone. If you label the instrument about a third the way up on the inside back of the instrument, it will be visible when you peer through the soundhole. You can glue in a paper label, carve something, burn it in, write it with ink – some people even inlay their signatures with wood or mother of pearl. If you plan to keep your instrument around for a while, a label might be helpful. Now that we have the back out of the way, it’s time to move on to the top, otherwise known as the soundboard.